Divided back. 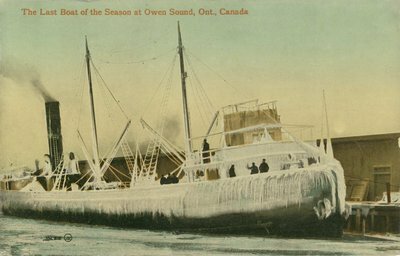 Postmarked Owen Sound, ON, 11 May 1914. This is an exact duplicate of an image marked "The last boat of the Season at Port Arthur, Ont. Canada and given the same number in the Valentine & Sons sequence (106,816). "The Last Boat of the Season at Owen Sound, Ont., Canada" "106,816"